It’s not only the British who love a traditional afternoon tea, complete with dainty treats exquisitely presented, and tea sipped from the finest bone china. 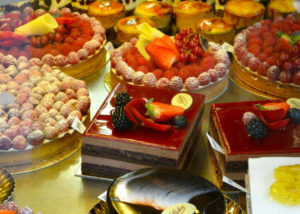 The French too love to make a special occasion of afternoon tea, enjoying sweet delicacies and special blends of teas. Whenever we’re in Paris, we love to explore some of the wonderful food areas of the city. We’re very fortunate that one of the best outdoor markets in Paris at Place Monge in the 5th arr. is right on our doorstep. Rue Montorgueil on the Right Bank has also long been a firm favourite. We’ve spent many years pottering about the French countryside, often revisiting favourite places—towns, villages and historic sites. A great way to plan a driving holiday is to pick a region and then explore its attractions. How though to identify the most interesting and rewarding, and the most beautiful, places? One way we do that is to find out if our chosen region has any villages that are members of L’Association des Plus Beaux Villages de France. We were very curious to see just how they could create a museum from such an esoteric subject as perfume. It also had the potential to be quite overwhelming, with too many scents vying with each other, and a sinus-sufferer’s worst nightmare! As it turned out, it’s one of the most fascinating concepts we’ve ever experienced. Shop ’til You Drop at the Paris Sales! If, like me, you love to shop, especially if there is the lure of snaring a great bargain, I’ve got some very useful tips to help you make the most of the whole SALE shopping experience. One of the great attractions of Paris is the excitement building up to the start of the end of season sales.